If you were planning to vote for the Hugos this year, today’s the day: The deadline for getting your Hugo ballot in is 11:59pm Central time. Here’s all the information, plus a link to the actual ballot. I suggest voting sooner rather than later, since there’s nothing worse than a last minute rush for the online ballot and the servers getting jammed up. Then they have to sacrifice a Campbell nominee to the angry server gods. Don’t do that to the Campbell nominees, folks. They’re good people. If you meant to vote but still have not gotten your membership, dude. Get on that. Here’s the page with the membership info. Better hurry. 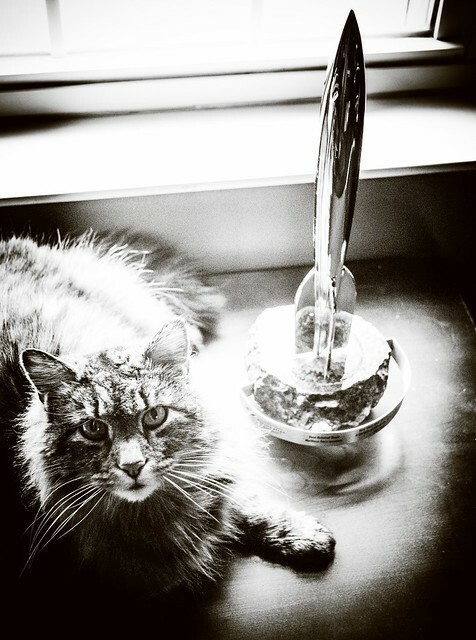 This year, each Hugo award comes with a cat! Which makes it THE BEST HUGO YEAR EVER. Unless you are allergic to cats. In which case, YOU GET A HAIRLESS CAT. Which are freaky. But still awesome. Entered my votes on Sunday. Sadly I didn’t make it through the Campbell Award novels or the Related Works. This year I asked my wife for a WorldCon membership for Father’s Day. After she finished rolling her eyes at me, she told me to buy it. I didn’t read everything, but I read what I could. Votes are in. Votes in as of a day or two ago! Didn’t get to everything, but I feel pretty strongly about *most* of the categories I voted in. Voted yesterday, after I saw your tweet. Good luck to you and all the other nominees. You’re in good company. I’ll miss going this year cause I don’t have the money, but a supporting membership still gives me the right to vote. Thanks for the reminder. Caption: Long-suffering ghost writer poses with Hugo Award. Got my votes in yesterday — man, there was a lot to get through this year, with many awesome entries. You have won this comment thread. Please inform Lopsided Cat that I’ve voted, and the husband is voting right now, with our cat on his lap for proper supervision. Anything to avoid being judged further by ScalziCats, esp. The Radiant She. Thus in the author’s triumphal moment, a dose of feline disdain is provided to remind the author of his or her mortality. I’m sorry John, but your first comment is wrong. People allergic to cats are not allergic to cat hair. They typically react to a protein found in the cats saliva. So you’d get an allergic reaction even from a hairless cat. AFAIK there are some races where this effect is less pronounced. Also you can purchase genetically modified cats who don’t share this specific protein.